There's been a sort of ghoulish fascination in watching house values ebb from bubblicious heights. But now that sales are rising sharply, (S.F. Bay Area Home sales see first monthly gain in 6 months) the bottom must be in, right? Whew. Those two years of decline after 10 years of rising values were brutual. Notice that point just past the peak where the "smart money" announced the all-clear and hapless believers jumped back in, only to suffer devastating losses shortly thereafter? Here is a depiction of the process at work in housing. The current spike in "bottom fishing" is what I term the "false bottom." In areas with strong employment like the San Francisco Bay Area, there are plenty of reasons for anxious buyers to reckon this is a bottom. We recently went to an Open House with some friends of ours, a young (late 20s) very well-educated couple with professional jobs (i.e. DINKs--double income, no kids). The house was listed at $650,000 and judging by the crowd at the Open House, it certainly looked like it might fetch the asking price. It was completely renovated in a nice neighborhood of mostly 90-100-year old homes, few of which have ever been truly renovated, so the house had real value in comparison to its peers. Nonetheless, $650,000 for a two-bedroom (one "bedroom" being a loft, so technically it was still a one-bedroom) bungalow in a good but not outstanding neighborhood seemed a bit rich, seeing as how other friends of ours had bought a similar house in 1997 and completely renovated it for a total cost of about $220,000, or roughly a third of $650K. As long as there is a pool of well-paid potential buyers like them, prices won't decline in desirable areas until this pool has been drained (buys, moves away, loses a high-paying job). Another group of people were at the Open House--people who'd dumped their houses right at the bubble peak a few years ago and were now looking to buy another house at a depressed price. There are plenty of these folks itching to "buy at the bottom," and so the prices in desirable areas can't really decline until this pool of buyers is also exhausted. In other words, prices can only start falling when all the anxious qualified buyers --those who have waited patiently for two years, and those who sold out two years ago and are looking to re-enter the market despite high prices--have all bought a house. I don't see how technology won't be impacted by a global recession, and therefore I expect lay-offs to eventually hit even the "golden" areas of current employment strength. But right now, that is merely conjecture. Those ready to call the bottom in housing will claim tech employment will ride out the slowdown because it's based on continuing global growth and the weak dollar. And those are of course permanent conditions, just like rising housing values. The interesting point in charts like this is the symmetrical nature of the bubble's rise and fall. In the Nasdaq chart above, the spike took about 1.5 years to reach its zenith and about the same period of time to fall back. 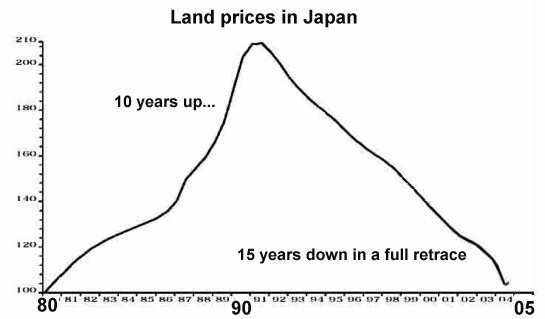 Japan's land prices rose for a long time, and declined for a long time. This characteristic is shared by bubbles in all time frames and locales. So will the housing bubble play out like every other bubble, or is this "the bottom"? Ultimately that will depend on jobs. Maybe this will be the only recession in history where there are no job losses in high-paying tech-related industries, and the only global recession which causes tech spending to rise. But to bet on those conditions holding true is to bet against a considerable backlog of history. Thank you, William K. ($15), for your generous contribution to this site. I am greatly honored by your support and readership.